How easy it is in today's world to reach out by fax or phone or E-mail to the most remote city on earth, yet how difficult it is to contact the peace and joy within one's very own heart. In The Art of Positive Feeling Swami Jyotirmayananda provides a bouquet of colorful stories, joyous humor, and profound insights that will guide the hearts of spiritual seekers of all backgrounds and faiths to the unfoldment of the most sublime feeling. Never before has the war against the ego and its degrading antics been so delightfully taught! Never before has the goal of life - a heart overflowing with ever increasing Divine bliss - been so brilliantly expounded! In human personality, thought and feeling are interrelated like flower and fragrance. If a person lacks profound feeling, his thoughts become weak and ineffective. On the other hand, if his thought is negative and ego-centric, the feelings of his heart become like a polluted stream-tinged with anger, hate, pride and various impurities. Having written his much acclaimed book, The Art of Positive Thinkiing, Sri Swami Jyotirmayananda felt the need of writing a supplementary book, The Art of Positive Feeling. These two books present a complete picture of the mystical art of controlling and culturing the mind for attaining Self-realization. In this wonderful book, Swami Jyotirmayananda provides a bouquet of colorful stories.joyous humor, and profound in- sights that will guide you to the unfoldment of sublime feeling within your heart. 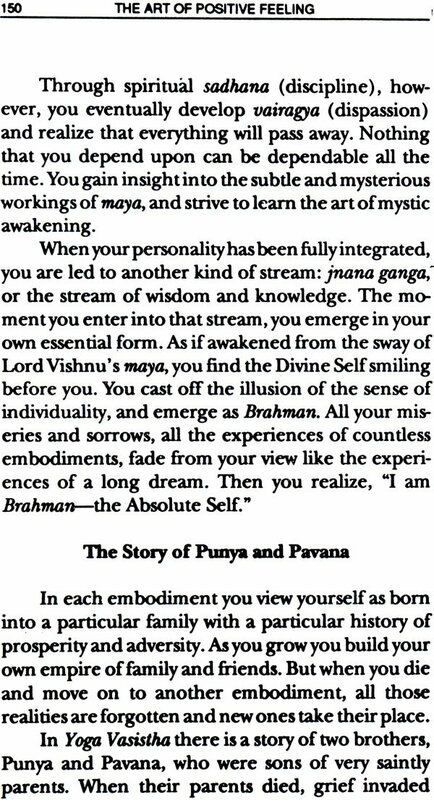 In the second portion of the book, Swamiji gives insight into the process of converting normal feeling (bhavana) into spiri- tual feeling (bhava). When spiritual feeling blossoms. Divine Love rises like the full moon and a devotee. having shed the veils of illusion. becomes one with God. There is nothing so sublime as a heart permeated by Divine awareness--a heart that is like a golden cup overflowing with ever-increasing Divine Love and Bliss. Undoubtedly. this book will prove to be a fountain-source of inspiration and strength for all who read it. With The Art of Positive Feeling as your trusted companion. may you be led to the highest communion with God and enjoy a dynamic awareness of the Divine Presence at all times! Every human being has within himself a fount of inexhaustible strength and joy, because he is essen- tially the Divine Self. Butdue to wrong ways of thinking and feeling, man acquires various weaknesses-which do not allow him to develop his inner potentiality. These weaknesses or impurities in the mind obscure the majesty of the Self as clouds in the sky obscure the brilliance of the sun. The soul has six dangerous enemies, referred to as shad-ripus. These impurities, which are also referred to as vikaras, are kama (desire for sense-pleasures in general, passion in particular), krodha (anger). lobha (greed), moha (delusion, infatuation). mada (pride). and matsarya (jealousy). Matsarya is also referred to as irshya. and asuya. With a slight variation they all mean jealousy in different forms. These six interrelated impurities or vices. which actu- ally include all negative qualities that plague human personality, are considered the ripus-enemies from one's very childhood, indeed enemies from many incarnations. As long as these enemies are not con- quered, one cannot enjoy real prosperity or peace in life nor attain enlightenment. Thus, it must become the challenge-• as well as the delight-of every aspir- ant to find those debilitating weaknesses and endeavor to remove them in order to awaken within himself the glorious vistas of spiritual unfoldment. "O Indra, may you crush by your thunderbolt the demon that moves in the form of an owl, an owl's young one, a dog, a chakravaka or ruddy goose, an eagle, and a vulture." What is the demon in the form of an owl? Moha or delusion. An owl cannot see during the daywhen other animals can see. Thus the owl is a symbol for a person that is blinded by delusion. A person overcome by moha can see only within the range of his egoistic feeling, but beyond that he is blind. What is the demon in the form of an owl's young one? Jealousy or matsarya. Jealousy thrives in the ab- sence of the light of rationality, reason. If you were to understand another person's life with penetrating vision, you would realize that there is nothing in that life to be jealous about. Everyone's life in this world of relativity has severe shortcomings. Thus, being jealous of someone for any apparent form of prosperity is usually totally irrational. That irrational envy, born of delusion, is the offspring of the owl of moha. What is the demon that comes in the form of a dog? This demon is krodha or anger. When dogs fight they are totally unable to control themselves. You may teach your dog all types of lessons in training school, but when another dog challenges him for food, for example, he loses his temper completely. The demon that comes in the form of the chakravakra or ruddy goose is kama or desire. This animal is well-known for its amorous courtship. The demon that soars in the form of an eagle is mada or egoistic pride. Finally, the demon in the form of a vulture is lobna or greed. Seized by greed, one does not have any discrimination. He is driven to possess and devour everything, just as a vulture eats all types of rubbish without any reservations. Indra, in this context, is God, the Almighty. An aspirant seeks the blessings of God for the destruction of all these enemies of the soul. 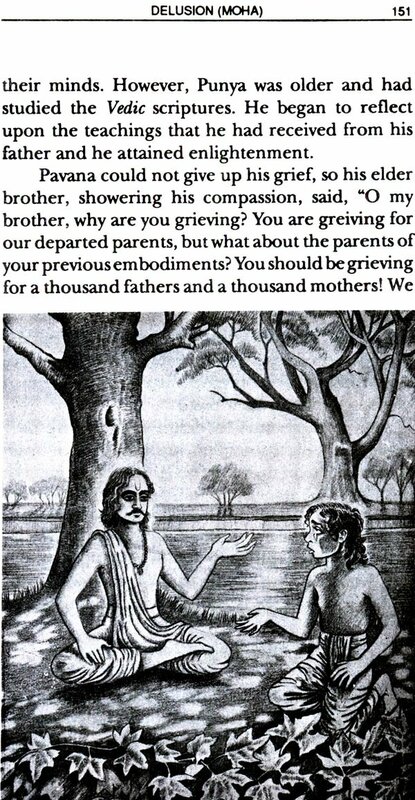 An aspirant must reflect deeply-• but with a gen- erous sense of humor-upon this Vedic satire of hu- man weaknesses. Due to his own shortcomings, does he really want to be as uncontrolled as an angry dog, as absurd as an amorous goose, and as greedy and undis- criminating as a vulture? Unfortunately, wrong ways of thinking and feeling often make human beings less virtuous-rather than more elevated-than their ani- mal counterparts. However, with persistent introspec- tion and sincere self-effort, every person can become the embodiment of Divine bliss and perfection that he is intended to be.